This morning, after coffee, looking out the kitchen window, I saw a strange cat sleeping on my cat’s garden pillow. It is not this tabby cat, it is not my tuxedo cat, it is not my orange cat. It is absolutely not going to be my cat. It is a tiny black cat with a single white whisker. It has no collar. We met for the first time and were quickly on friendly terms. Whoever it is, it is absolutely not going to live with us; the other cats do not tolerate interlopers, but kids have a need to name cats. I opened up my laptop and saw this wondrous picture, saw this other magical cat, not one of my cats, not Nico-Anish Kap-paw. 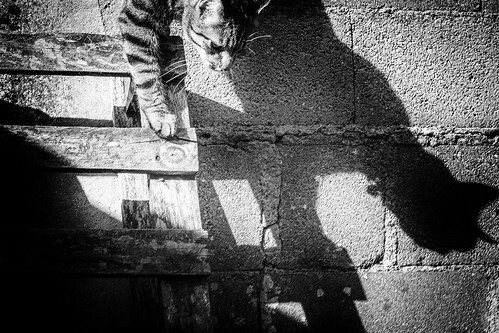 I saw this tabby cat, happy with its shadow, and I remembered that cats do not need their names. Happy Furry Friday.